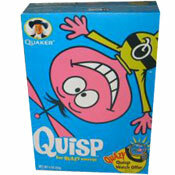 If you care, even the slightest bit, about omelettes, don't bother with this product. The gimmick is that you put eggs in either side of the fold-over container. You add your filling, flip and nuke. That's how it works, unfortunately the resulting omelette is a fantastic mess. Let's face it. Eggs prepared in the microwave are weird. They taste funny and the yolks turn green. There's nothing this pan can do to stop it. I made several omelettes and it was always a crapshoot whether the filling would cook or if the omelette would hold an omelette-like shape. You save very little time and effort compared to making an omelette on the stove. If all you have is a microwave, my advice to you is to get a better job. To make a decent omelette, the old-school is still the only school: surface heat, a frying pan and a spatula. 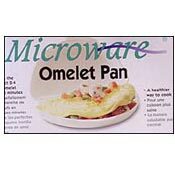 What do you think of Microware Omelet Pan? Makes my eggs taste like plastic too. I would like to see a video on cooking in a microwave omelet pan?? I think that the problem is that you didn't follow instructions. I spray the inside of the pan with cooking oil, pour the egg mix in both sides evenly, cook for 1 min. 30 seconds, take it out of the microwave, add all other ingredients, cook for another 2 minutes and get a perfect omlette every time. Eggs cooked -- if you call "made rubberlike" a form of cooking. Except for the middle, which was a bit raw.